The full view of parcels and property taxes within 35th-Bronzeville-IIT (Green Line) station are for Cityscape Pro and Cityscape Permits members only. Use one of the tools buttons to see more data. Many properties don't have information about property owners. This is because the properties are non-taxable (tax exempt) and thus the tax billing name & address isn't included in the source data (Cook County Assessor). Building age data is not always reliable. This feature was supported by the Metropolitan Planning Council. You can purchase all of our Cook County data in the Map & Data Store. Property information is updated twice a year; tax and property classification information is updated after the second tax bill goes out (mid summer), and assessment information is updated when a triad is re-assessed (variable). 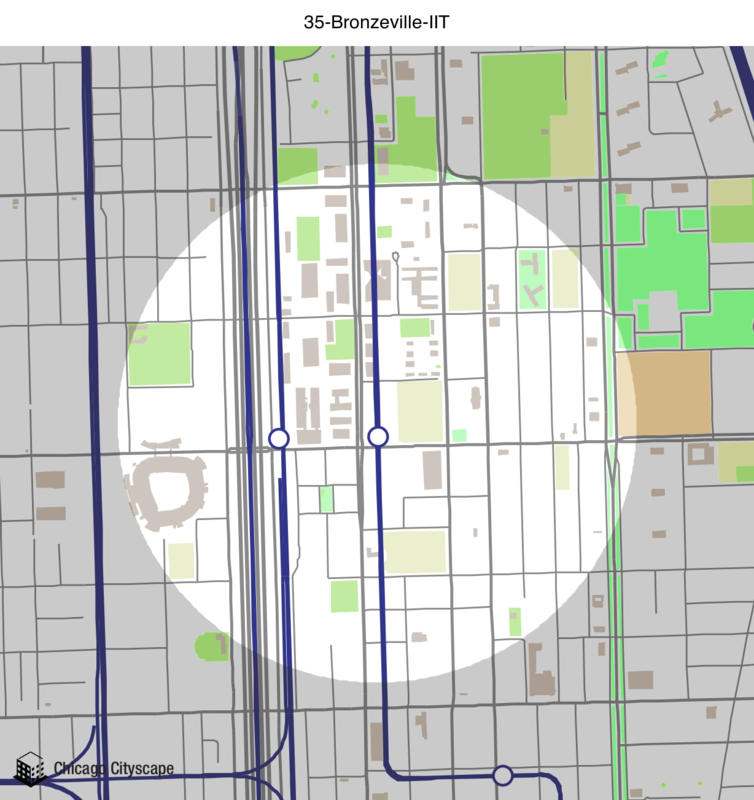 You're free to use our static map of 35th-Bronzeville-IIT (Green Line) station, but please attribute Chicago Cityscape and link to this page. The search area of 35th-Bronzeville-IIT (Green Line) station is 0.0488 square miles. Want to know what you're allowed to build near the 35th-Bronzeville-IIT? Order a Zoning Report instantly from MAP Strategies. The majority of submarket 3 falls within the boundaries of Chicago, as well as parts of Oak Park and Evanston and can generally be characterized as a strong urban market. High and growing incomes generally mitigate high and increasing home prices and rents, resulting in lower levels of cost burden. Submarket 3 has the lowest transportation costs of any submarket. The housing stock can be characterized as high density urban, primarily consisting of older homes. While many residents of this submarket rent, only in submarket 3 did the share of households renting decline. Lower levels of subsidized housing are found in this submarket. Submarket 3 has a very active housing market with high levels of mortgage activity, turnover, and low vacancy. There are low levels of foreclosure activity and cash sales. The households in this submarket are younger, middle and higher income, with high levels of educational attainment. Smaller households, often 1-person, with few children fit the submarket’s high-density design. Submarket 3 was the only submarket to see an increase in median household income. Submarket 1 consists primarily of urban areas concentrated on the south and west sides of the City of Chicago, but also includes parts of Waukegan, Joliet, and south suburban Cook County. These communities are medium density with many 2–4 flats built before 1940. High rates of vacancy, foreclosures, and distressed sales in Submarket 1 may undercut the quality of existing homes. Significant population loss in Submarket 1 communities is likely both a cause and an effect of local levels of property distress. Nonetheless, Submarket 1 has good access to the regional transportation network, which helps keep transportation costs low. Despite low housing values and costs, declining incomes among Submarket 1 households have led to increased rates of cost burden. Educational attainment levels are low, and households in this submarket are lower income with the largest income declines of any of the submarkets. The submarket has experienced high unemployment, which has increased over time. Communities in this submarket are also aging, now with a greater share of older adults and fewer children under 15. There are eight submarkets, or clusters of similar housing issues and neighborhood characteristics. The "cluster" information is from the Regional Housing Solutions and is based on data from the American Community Survey, collected in 2009-2013, and is a collaboration among CMAP, Institute for Housing Studies, Metropolitan Mayors Caucus, and Metropolitan Planning Council. Show a map of all the Places that overlap 35th-Bronzeville-IIT (Green Line) station, including ZIP codes, Census tracts, legislative districts, and TIF districts (this may take awhile if 35th-Bronzeville-IIT (Green Line) station has a large area). The zoning layer colorway comes from Second City Zoning.